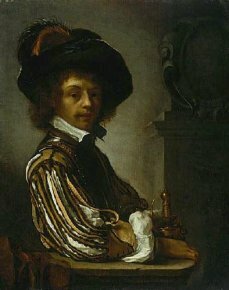 15/06/2007— Theft — Sydney, Art Gallery of South Wales — Last Sunday, June 10, 2007, a painting by Frans van Mieris, representing a Cavalier (ill.), probably a self-portrait, was stolen from this Australian museum. Operating during visiting hours, the thief managed to get away without arousing any suspicion. The work is small enough to hide easily under a loose garment. Dating from around 1657-1659, this panel is thought to be a self-portrait. According to the museum, its pair, representing perhaps the artist’s wife, is held at the Kunstmuseum in Basel. Although they are of identical size, the disposition of the subject is slightly different. Both works reveal the meticulous manner inherited from his master Gerrit Dou. This Cavalier had been donated to the Art Gallery in 1993 by the Australian collector James Fairfax.